McALLEN — A former U.S. Customs and Border Protection officer was finally sentenced Monday after spending the better part of two years in solitary confinement. Julio Cesar Trujillo, who spent nearly 600 days in custody, was sentenced to time served with an additional two years supervised release, court records show. Trujillo’s sentencing had been delayed at least three times during the course of his federal case dating back to April 4, 2016, when he pleaded guilty to the bribery charge he was facing, court records show. About five months later, Trujillo’s attorney, Marcus Barrera of McAllen, who was unsuccessful in prior instances with regard to bond, was able to secure his client’s release on bond in September 2017, citing his family ties to the Valley and the lack of a flight risk to the court. 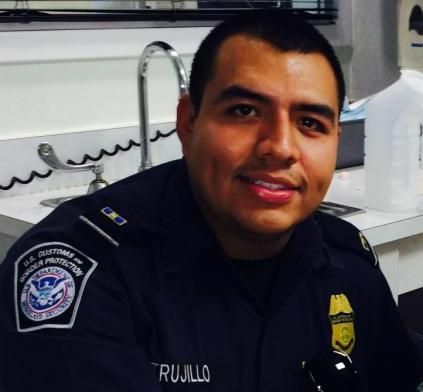 Before that, Trujillo had to be separated from the general population for his safety and was placed in solitary confinement — this due to his prior occupation as a CBP officer. Barrera stated that while in custody, Trujillo was confined to his cell for 23 hours a day for the entirety of the 593 days he served. “He paid his debt in a very harsh way,” Barrera said. Trujillo was facing one count of bribery of public officials and witnesses, related to an incident in January 2016 when Trujillo met with an FBI informant in the parking lot of a Mission restaurant and accepted $3,600 in cash in exchange for an extension of a visa and the procurement of a visa for a second person, according to court records. Because of his position within CBP, the 32-year-old ex-CBP officer from Mission had the ability to extend an individual’s visa and had access to protected computers that are exclusively for the use of the U.S. government. Trujillo worked at multiple ports of entry throughout the Rio Grande Valley, including the McAllen-Miller International Airport, according to court documents. The feds also accused Trujillo of exceeding his authorized access by performing a records query for the new visa, the criminal complaint states. But court records show he was only indicted on the bribery charge. During the recorded transaction more than two years ago, Trujillo also told the person who needed a visa extended to meet him at the Hidalgo-Reynosa port of entry during his scheduled shift, which was to be Jan. 29, 2016, according to the complaint. But Trujillo never made it to that shift, as he was arrested and had his initial appearance in court that same day before a federal judge. He was originally charged with bribery and exceeding access to a government computer but was only indicted for bribery in February 2016, court documents show. Trujillo was facing up to 15 years in prison and a possible $250,000 fine, but prosecutors agreed to recommend the judge rule on a reduced sentence in exchange for his guilty plea, court documents show. On Monday, before U.S. District Judge Ricardo H. Hinojosa, Trujillo was given a sentence of time served, with two years supervised release, court records show. Barrera said Trujillo has admitted to his mistake, paid his debt and looks forward to being a productive member of society for himself, his family and his kids.